In the recent past there was only one way to build a mobile app which was by programming the smartphone using its platform’s native programming language. If you wanted to build an Apple/iOS app, you’d use Apple’s software development kit and if you wanted to build an Android app, you’d have to use Android’s native language. Native apps are built specifically for a mobile operating system such as Apple iOs, Android or Windows phone. The app must be built to conform to the requirements of each operating system and is not interchangeable one with the other; therefore you cannot use an iOS app on an Android device and vice versa. 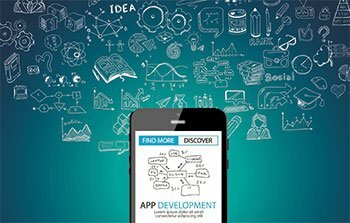 Native apps are usually built by a developer in the specific language necessary for the desired platform. These apps are downloaded from the respective app store to the device and are stored in the device’s memory, making them ready for use at the click of the icon. They are highly customizable and offer a wide variety of structure and visual appeal. Native apps offer the best user experience as they follow the conventions of the platform’s user interface (UI) and are faster and more reliable. These apps have access to phone hardware and operating system features such as camera, gyroscope, sensors, gps, accelerometer, address book, calendar, phone, etc. They are easily found in the platform’s app store and many are able to be used without an internet connection. They are more expensive to build than other types of apps, but also offer the most advantages. Most of the code can be shared between platforms which reduces cost and time to launch. The user experience will be more seamless between different platforms which is important because many people own more than one type of device. Most bugs in the code need only be fixed once across all platforms. App owners have a wider audience from the get go without the increased cost necessary when building apps on different platforms. To build cross platform apps, developers use tools such as React Native, NativeScript, Xamarin, or Appcelerator. Hybrid/HTML5 apps can be built using Sencha Touch, Cordova, PhoneGap, and Ionic. At ClearTech Interactive we know that every customer has different needs, ideas and resources for their mobile app project. Fortunately we offer several routes to take for building mobile apps. Since 2003 we’ve built thousands of projects for our clients. We offer a free consultation ($250 value) to discuss your mobile app idea and provide some guidance. Request a Call or contact us at 727-562-5161 to find out what we can do for you. We offer full digital solutions to power and grow your business. ← What is Marketing Automation and Why Do You Need It?